5 Creative Habits You Can Steal for Innovation. Over the past four years I have worked on or lead teams that have the word ‘innovation’ in it’s title. The title brings with it a weight to make new and valuable products. Looking over these past years some patterns have emerged. 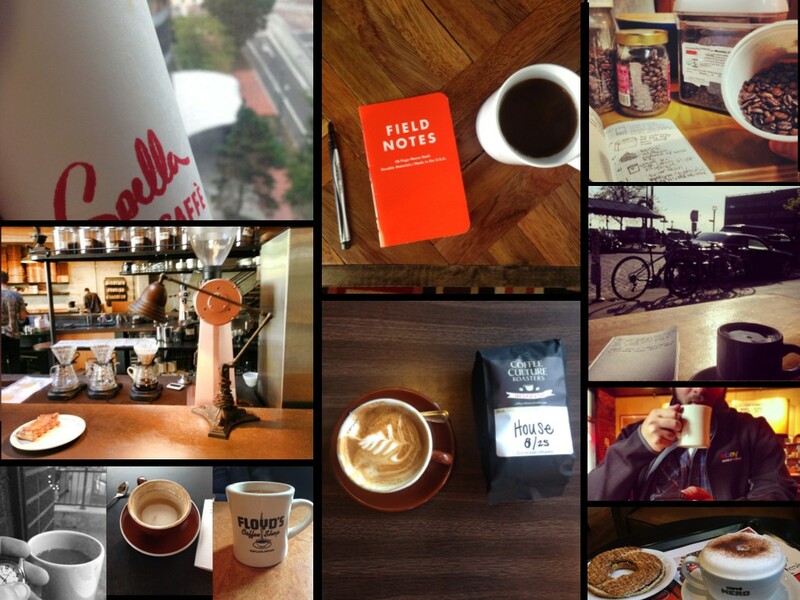 One I drink a lot of coffee and two I developed a number of creative habits. I noticed that everything I make, all the product and process ideas, come from my collective creative practices. The sum of my work is greater then the parts and all the parts impact the sum. While coffee is important to the creative process, I needed to be more consistent in generating new product ideas. I tried odd habits to be sure and I’m continuing too refine and experiment with my daily habits. I have found tons of value in looking at all the all my habits and how they fit together. The following is how I operate. The first thing I do hands down is free up my headspace. 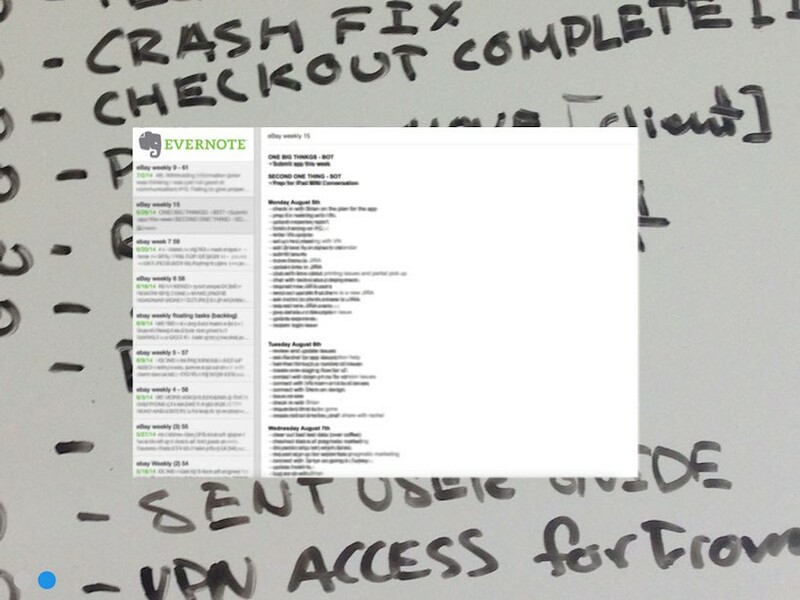 For the past 90 plus weeks I have kept a daily log in Evernote of what I need to do. At the start of every week I create a new note, I add a header for each day that week and one for backlog items. I review my major goals and write 2 or 3 at the top of the document. This is important so that I don’t get lost in the world of tasks and stay focused on goals. If the goals don’t get accomplished all the tasks in the world don’t matter. I could quote Peter F. Drucker here but I’ll just drop his name. From a high level I make sure I know what I need to do and that I have a place to store all my small tasks. This process removes all this clutter from my head and email inbox so I can focus with room for new ideas. We are all influenced by the massive amount of information coming at us each day. My goal is simply to own my influences. I add filters and boundaries to block out the noise. Then more importantly I seek out leaders, artists and culture makers to consume their body of work, trace who is influencing them and look at what principles they are driven by. Another great way to think of influence rather then by person is by industry or field of study. If you are in the fields of mobile apps, learn about the process of designing environmental systems or about how scientific research groups work together. New types of influences open me up to new concepts and have always changed how I see my own industry. This is the habit I have experimented with the most. There are two hypotheses I have. If I can’t always remember where I left something and I forget dreams, then the fleeting ideas I have in an odd moment may be lost of I don’t capture them. Everyone has a lot more then just one idea; by capturing an idea it allows the freedom to move on to the next one. The practice of capturing takes practice. I have tried a few things. About a year ago I tried generating 50 ideas a week for a few months. I carried a spiral 3×5 notecard booklet and a sharpie with me at all times. It’s hard to generate that many ideas so I ended up with lots of bad ideas. Still if it takes 100 ideas to get to 1 good idea then all the bad ideas were just steps towards something great. Currently I keep a notebook and a medium point sharpie pen with me at all times. 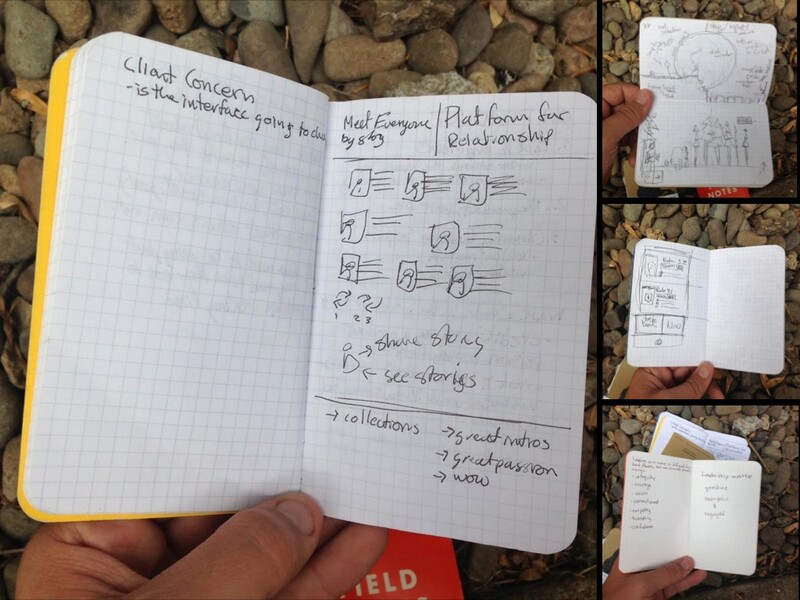 The preferred notebook is some kind of Field Notes booklet — though anything will do. Having something on me that doesn’t require a battery or need multiple apps to type and draw is very helpful. When ideas are externalized it forces them to take a solid sharp and pushes out some of the vagueness. Another benefit of externalized ideas is that it allows other people to tare into an idea and not a person. By externalizing I mean writing ideas on a white board, in a notebook, or in a digital collaborative space. I do this to get ideas out of my head and turn them into something of their own. It allows me to invite others to change the idea and react to it. Externalizing allows for collaboration and collaboration is like a super power. I have repeatedly found that simply bouncing an idea off another person often brings a new perspective and insight. This is not new but consistency is what makes this a habit. I worked on a mobile game this last year, and while it was a mostly a solo project as far as the hands on work goes, it was shaped greatly by others input. Really this is how most projects work, incredibly useful and valuable insights come from real users and cross functional team members which changes the a project in ways unforeseen. One of the habits that I have been playing with is posting new prototypes and ideas on my office walls. Then when people walk in if something catches their eye they can speak to it. This generates good conversation and insights. I’m still looking for ways to externalize ideas such that it promotes collaboration, for now I’ll keep my whiteboard full and my office walls fresh. This means two things to me. My ideas don’t cost anything to burn, so I push them over a cliff watch them burn — or let someone else do it without worry. I look to the principle of ‘yes, and’ to keep ideas flowing forward. I try to share ideas even when I know they can’t work and I encourage others to do the same. Sharing wild ideas can lead new insight, new ways of looking at things. The wilder the better. Actually going to the wild has been very good to me. Getting out of cell phone range and recharging my ‘soul batteries’ as it were, brings a fresh perspective. It allows lots of headspace for everything to coalesce and new connections to form. Additionally being out in the wild humbles me and reminds me I’m human. That we can survive on a lot less. Food, water, shelter and great company are enough to be happy. These habits are a work in progress and they likely always will be. I could simply go about my day and browsing websites for inspiration but that sounds boring. I want to make new and valuable products that come from exploring the world, collaborating with others, having insights across industries, and recognizing users as people. Currently this is my process and where my best work comes from. I’d love to hear habits from others, and what people do to create new work. Previous Post Principles for Creative Habits.